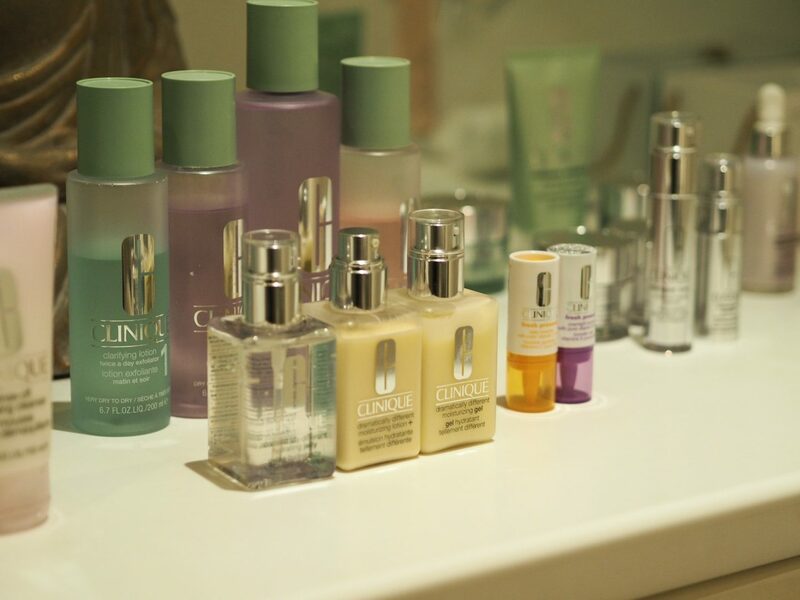 A Refreshing Facial With Clinique Cribbs Causeway! In my first year or so of blogging, I posted quite a lot about skincare. Regular reviews, collaborations and every now and again, a bit of education about skin thrown in that I learned from my days working at The Body Shop. My skin has been quite complicated in that it changed a lot. For so long I was a bit of an oily mess that struggled to keep their makeup on. I then went to combination with just a super oily T-zone and then when I got unwell and was swapping between strong medications and treatments constantly, my skin took a huge beating. I’ve mentioned it quite a few times in posts but I ended up with medically-induced acne that was persistent and so painful. I could also never figure out what my skin needed, it would go oily, then dry, then back to combination then dry again and so on. My skin is never super oily anymore but I do get regular T-zone issues – more towards the blemish, large pores and blackhead side of things though. Towards the end of last year after my surgery, I felt like I’d finally found the perfect products for me. My skin settled and I’d say it’s combination that is leaning much more towards the dry end of things. I did upload a post recently about my updated skin saviours so you can give that a read here. You may have noticed I’ve stopped posting much about skincare and it’s because it’s really rare that I accept skincare collaborations anymore as I don’t really want to stray from my current products as I’m so happy with everything about my skin right now. I’m so lucky that I regularly get to collaborate with a few of my favourite skincare brands and I’ve recently become part of the VIP blogger team at the Clinique counter in John Lewis Cribbs Causeway! 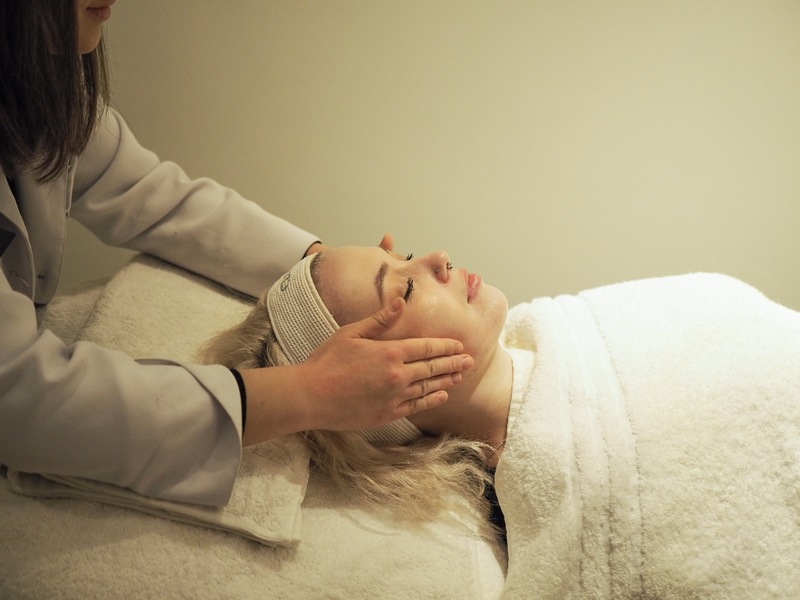 I’ve attended two of their launches in recent months and then my friend Becky and I were kindly invited to experience a lovely facial by Jess in The Beauty Room! The Beauty Room is a relaxing and tranquil little space tucked away from the hustle and bustle of the bright and beautiful shopping area of John Lewis. I never actually knew it existed until being shown it at an event! You’d never believe just how quiet and serene it is when there is such a loud and busy live store right next to it. 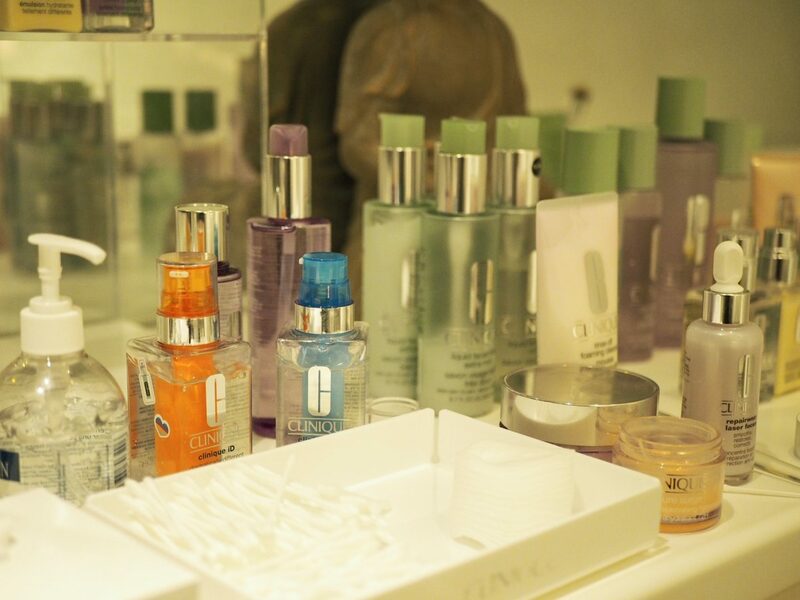 The Beauty Room is used by the majority of brands that have a counter in John Lewis but mostly the ones that provide a wide range of skincare with the need to offer facials to showcase their benefits. The lovely Jess set the room up with low lighting and calming spa music. Firstly, you’re asked about your skin history, any problem areas and sensitivities so that the expert can tailor the products and techniques specifically to you. After lying on my back and pushing my hair out of the way with a hairband, the facial begun with Cliniques famously sought after cleanser – their “Take The Day Off” balm. It gently and effortlessly removes all traces of makeup and leaves the skin feeling silky smooth. Next up was the Vitamin C powder which you mix with water until it lathers and then massage into the skin. The Vitamin C powder helps to brighten and even out texture. Jess then used the Clinique sonic cleansing brush, 30 seconds on each side of the face whilst this product was on the skin. It provides a deeper cleanse due to bringing dirt to the surface (I definitely need one of these at home). Once all the excess was removed, clarifying lotion number 2 was applied to everywhere but my T-zone where clarifying lotion number 3 was applied as it helps with oilier areas. The clarifying lotions smelled AMAZING too although I can’t really describe what the scent was like other than fresh. Next on was a thin layer of the Moisture Surge Overnight Mask. I have mentioned in my stories in previous weeks just how much this mask has helped my skin when going through a really dry patch! It’s a really wonderful and nourishing product, especially when an electric massager is working it into the face even more (I seriously NEED to get one of these things). Next up was the Repairwear Laser Focus Serum which was lightly patted into the face. This solution is for smoothing, restoring and correcting any imperfections on the skin such as pigmentation. The Smart Eye Treatment came next and boy I’ve heard some wonderful things about it. You leave it to soak into the skin and then pat it in afterwards. If you haven’t yet heard of the new Clinique ID range then you NEED to. Jess applied the blue ID next mixed with the Vitamin C booster, this combination is brilliant for brightening the skin and improving uneven texture. I’ve tried it before and it’s definitely the best for my skin out of all of the ID choices! Last but not least, a dab of the 72 hour Moisture Surge Hydrator was applied to my cheeks to complete the facial and leave them super hydrated. The Clinique Cribbs Causeway counter in John Lewis offer this service regularly and you’re also given the chance to have your makeup applied after the facial, too! I didn’t do this as to be honest I really wanted my skin to feel the benefits of the facial by leaving it bare. This service gives you a chance to try out many of Cliniques products and see what works best before purchasing. I always find these kind of things so helpful as what works for one person can be completely wrong for another! *This post contains a gifted experience for the purpose of promotion but all views are my own. I have never had a facial, but I think it’s great brands like Clinque offer them so you can see what products work for you before you buy them! This looks and sounds amazing! And so deserved – I hope you enjoyed every second! A little different but the pill I’m on has caused me to get hormonal acne. I’ve been on this pill for a few years and it works brilliantly in every other aspect but it’s wrecked havoc on my skin. Not a massive deal – there’s far worse side effects I could have – but still annoying. I never know what to do with my skin either. I don’t know what to use on what areas and I’ve just had a breakout now and it’s so annoying! I’ve just purchased some My Clarins products around a month ago which I really like (they’re CV and Vegan too!) but I just don’t KNOW. Skincare is so confusing haha! I love a good facial! It is so soothing! Not tried any of clinique products but have heard such good things about them! This looks SO relaxing! I may be booking a facial because of this. I never knew any of this existed! As I’ve gotten older, I’ve noticed how much my skin is changing and I have the problem with the meds too. I don’t look after my skin as much as I should due to my mental health so I may have to give this a chance when I next get paid! Thank you! Let me start off by saying I LOVE your new blog theme! I’ve been a Clinique advocate for absolutely ages so I’m not surprised that you had a good experience with them. I think I’d have done the same leaving my face bare after the facial but I love that they do offer your makeup afterwards too- I think a lot of people would feel less self-conscious leaving afterwards because of it! Skincare is so important! I’ve been a loyal customer of Clinique for a few years – love how light their products feel. It is pretty cool that you got to have a Clinique treatment! I feel like I need one of these, hehe. The Clinique Sonic Brush is GREAT! It clears out the bad layer of your skin. Glad you had a great experience with them! I’ve actually never had a facial, and I have never really noticed my skin changing so I never really thought about that someone’s skin could change like that.